The difference between companies and products is quality control management, Eachinled implements strict quality management in purchasing, developing, production, and after-service, in purchasing process we censor and analyze the capabilities and reliabilities of our suppliers, in developing process, trial production and per production are carried out before going into large scale production, in production process, IPQC, FQC and QA will inspect entire manufacturing process insuring product quality before shipping to customers. Eachinled guarantee its products and treasure its reputation of quality. 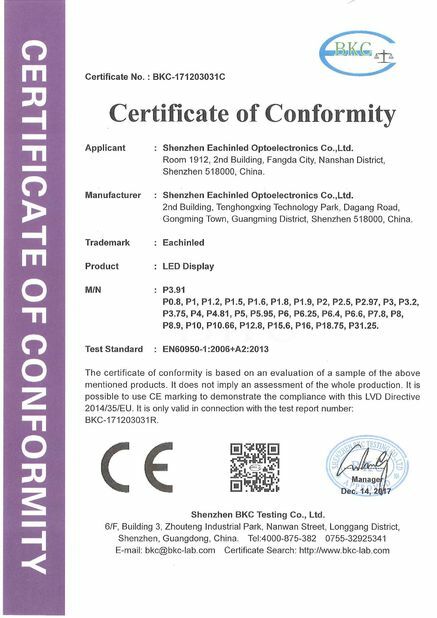 Eachinled quality control policy: market-oriented, instructions-guided, and continuous improvement together with clients, ensuring to provide customers with excellent products and outstanding services. 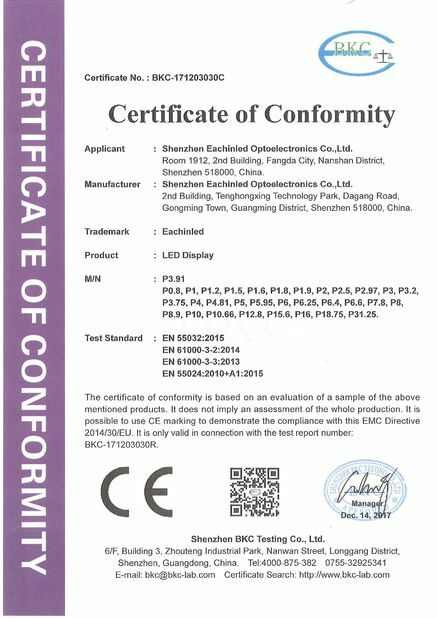 The structure of quality control organization of Eachin: under the leadership directly by president and CEO of Eachin, participated by production department, technology department and quality control department. IQC is properly done by warehouse and technology department;In accordance with established standards and instrucitons, before large scale purchasing, and mass production of finished products, samples of raw materials are strictly tested, the defective ones to be dealt with, or to forward important IQC to relative suppliers of such materials;all this has done, to ensure that all meets Eachin IQC standards and instructions. Prodution&Tech departments follow strictly the operation instructions of IPQC, which includes:"LED display production instructions", "LED display instructions for glue-filling”, "LED display assembly operation instructions", ect.All of the production employees get strict trainings before going to their work positions, and work instructions must be carried out strictly. 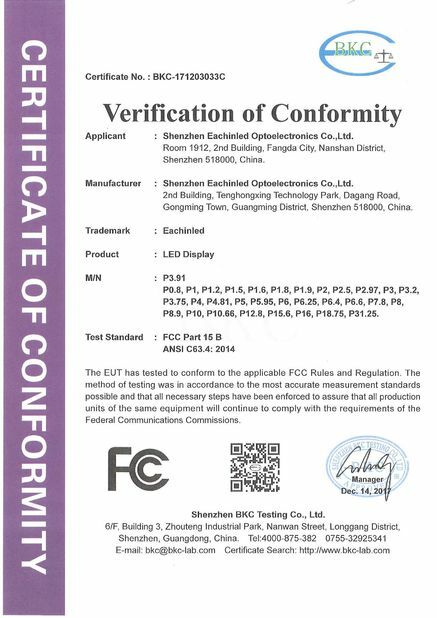 Once the above 2 processes are finished, the FQC is operated, such as "LED display test instructions", "LED display aging test instructions", " LED display packaing operations guidance", ect, to ensure good performances of finished products. 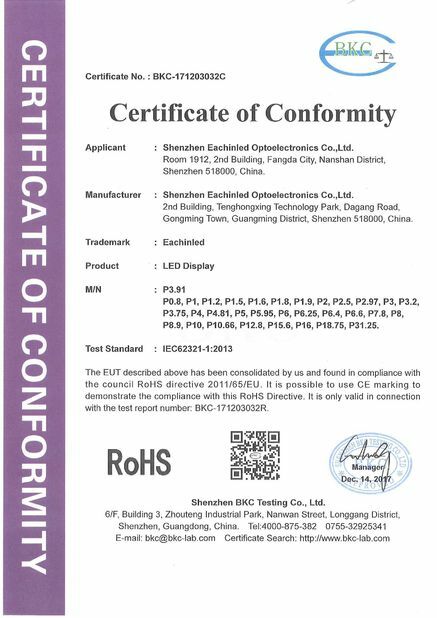 The Led Display installation strictly conforms to the LED display Installation requirements and operation manuals of Eachin.Once it is completely installed, Eachin makes survey of the satisfaction from clients, and makes following tracking for performances of led displays.